VMA Electric is proud to provide whole house audio and video services to homeowners throughout Marlborough, Natick, and surrounding communities in Massachusetts. Our experienced team of electricians has the expertise necessary to wire your entire home so that you can control multiple audio or video sources in different rooms from one single location. While we generally complete whole house audio and video wiring during new construction projects, we can perform this electrical service at any time, and we can even update your existing residence with new audio and visual equipment that you may want to incorporate. With VMA Electric’s experienced team working for you, you can benefit from having a speaker system installed with as many, or as few, speakers as you’d like spread throughout the rooms of your home. Whether each speaker plays the same music or different tunes is entirely up to you, and you’ll be able to control your entire whole house audio system with the simple push of a button on your computer, table, or smart device. 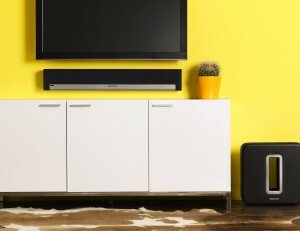 Additionally, we offer whole house audio solutions for a home theater or surround sound system from other trusted manufacturers like Bose, Nuvo, and Russound. As for whole house video, VMA Electric can revolutionize the way your family watches television. Utilizing a splitting system known as distributive video, we can enable a single cable box to control up to six televisions, all of which can show different channels at the same time. So, you can watch your favorite program while your spouse is enjoying a sitcom marathon and your kids are watching cartoons – everyone can be happy without any sacrifice. That’s the magic of VMA Electric and whole house distributive video. If you’re interested in learning more about the whole house audio and video solutions available from VMA Electric for your home in Marlborough or Natick, MA, please contact us today. Or, stop by our office in Marlborough to see the audio and video systems that we offer.